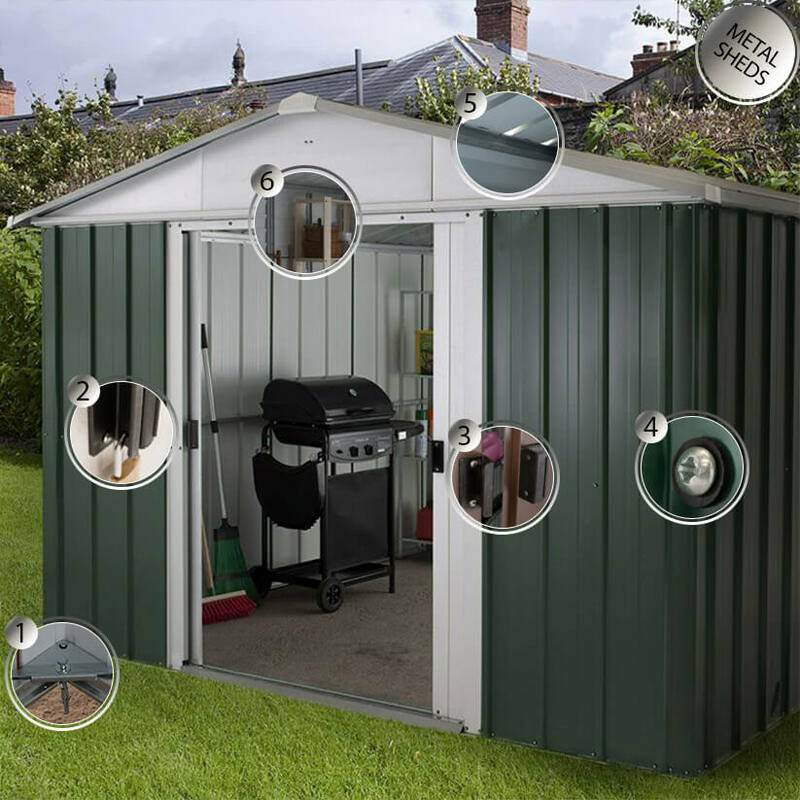 Cleverly designed, built from premium materials and with a fantastic 15-year anti-rust guarantee, this superior metal shed is the ideal place to safely store garden tools, outdoor furniture and bicycles. Cleverly designed, built from premium materials and with a fantastic 15-year anti-rust guarantee, the 10’ x 6’ Yardmaster Shiplap Metal Shed is the ideal place to safely store garden tools, outdoor furniture and bicycles. Completely constructed from hot-dipped galvanised steel, with a smart apex roof and a stunning baked-on taupe and cream finish, this premium metal shed is not only built to last but is incredibly handsome too. Easy access to this metal shed is gained through sliding double doors, which are overlapping, padlockable (padlock not included) and fitted with anti-tamper bolts, so stored items will be completely protected from the elements and unwanted attention alike. The roof is fitted with guttering, in order to maintain cleaner walls, whilst high gables and ventilation along the ridge and eaves make for plenty of headroom and ideal storage conditions respectively. What’s more, translucent roof panels ensure that the interior always benefits from plenty of natural light. Measuring 2240mm x 3030mm x 1970mm, this 10x6 garden shed comes with rust-proof screws, anchor fixings, clearly-numbered parts, an assembly manual and UK-based telephone support to ensure a straightforward, secure assembly.